Y's parents gave us this book for Chanukah and I pretty much started crying as soon as I saw the front cover. I guess that's not saying a lot because I passed two stray dogs on my way home from work yesterday and may have cried a little. Note to self: stray dogs don't like pita bread. Try something less ethnic next time you offer them food. But anyway, can you blame me for having my heartstrings tugged by this precious animal? 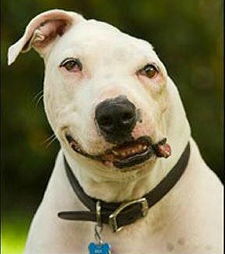 Oogy was a bait dog for a dogfighting ring. He was turned into an emergency vet and was about to die, but a staff member at the hospital insisted that they operate on what looked like a hopeless case. A family brought their cat into that vet to be put to sleep, saw Oogy, and fell in love. Of course I have another reason that this book makes me so sad. Does Oogy look... familiar to you? I can't lie, the thought of someone doing something so horrible to a puppy is horrifying, but it hits closer to home when that puppy probably looked exactly like my puppy. We have no idea what Ike's life was like before he showed up outside of the animal shelter in a box, crying, wormy, and mangey (hair was missing on his legs and tail and won't grow back on his legs). Luckily, I don't think it was quite as bad as Oogy's life as a bait dog. Either way, I'm glad he found us and can now partake in such fun activities as sticking his head inside a roll of wrapping paper. And after reading Oogy, I know his family feels the same way.